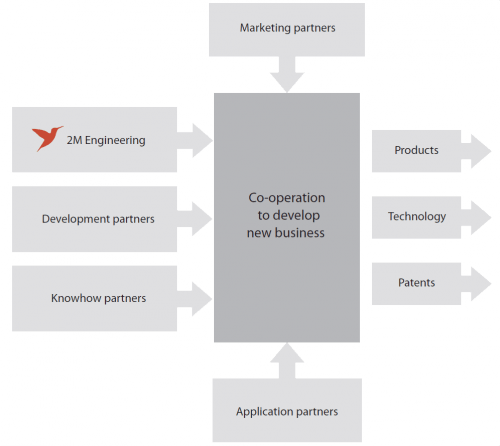 The open innovation business model as employed by 2M Engineering, enables development of highly innovative technology, leading to new products and services quickly. In our business model, partners with completely different backgrounds and very specialized or unique knowledge or expertise are brought together, ensuring the optimal application of state of the art knowledge in all required fields to work towards successful new businesses. Before starting a new business creation project all roles need to be filled in, such as technical development, product, market and industrial know-how including distribution & retail. In this way all partners share in both risk and reward. Innovation through co-operation.